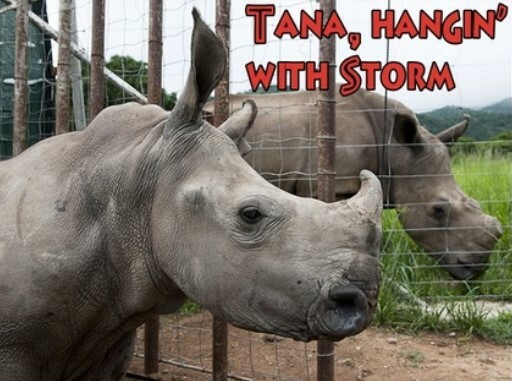 Baby Rhino Tana at Baby Rhino Rescue | Adopt and Donate Now! Tana arrived at Care for Wild Africa in March 2014 when her mother was poached on a private game farm. She was just three months old. A vet was to dart her and transport her to the sanctuary, but when he arrived at the scene, he realized that all the drugs had been stolen out of his vehicle! It was necessary to call in the nearest cattle vet. The cattle vet fired a dart, but it did not penetrate Tana’s hide. Eventually Tana had to be tackled and brought down by hand, and then placed in a crate. She was put into an enclosure with Wyntir and the two quickly became best sister-friends. Tana settled down quickly and easily. She is well adjusted, easy to please and the volunteers describe her as “one beautiful and chilled rhino.” She loves company and will come to the fence as soon as the volunteers arrive. She is also very beautiful, perhaps the most beautiful of all the rhinos at Care for Wild Africa, though all the rhinos are beautiful! She has pretty eyes and a tiny horn that is curved like an elf’s shoe. It is a most beautiful horn, making Tara one mighty attractive young lady. Tana and Wyntir now have a young boy rhino, Mabush, living with them too. When Mabush was introduced to the enclosure Tana was immediately friendly, welcoming and kind. The three rhinos are very bonded and happy. Once Tana was separated from the other two and she screamed so loudly, everyone at Care for Wild Africa came running! The volunteers love to spend time with these three rhinos because they are so playful and full of life. Tana loves fun. She is always the first rhino to start playing after her mudbath. They go out to graze on succulent grass during the day and in the hot afternoons, they lie in the leafy shade of the mango trees. Gazing upon this trio of rhino friends, the volunteers feel that all is right in the world.